WuZhong, also named HongSheng (弘声), member of the Hui minority, was born in the 51th year of KangXi (1712) in HouZhuangKe (后庄科) village of QingYun (庆云) county, ShanDong province. Wu Zhong lost his father Wu TianShun (吴天顺) during his childhood. Having nobody to rely on for subsistence, his mother wrapped him in swaddling clothes and carried him to seek refuge by their relatives of MenCun. They settled down in MenCun and Wu Zhong grew up under the protection of his remote nephew Wu YunMing (吴允明, eleventh generation) and other relatives (see Origins of the Wu family for more details). "One night when Wu Zhong was dancing around in his courtyard practicing sword, a man jumped down from the roof of the house. The man was a daoist monk wearing a yellow hat, Wu Zhong asked him about his name but the daoist did not answer. The man sat down and started to talk about martial arts. Everything the man talked about was totally unheard to Wu Zhong. Then the man made a demonstration of his skills, and everything he showed was totally unseen to Wu Zhong. Wu Zhong became the daoist’s disciple and learned Baji Qua from him. The man stayed 10 years with Wu Zhong and one day, he suddenly declared “now you have learned all my skill, I am going to leave" . Wu Zhong kneeled down crying and said to him “I have learned so many things at your side during these 10 years, my only sorrow is that I don’t know the name of my master”. The daoist answered deeply “the ones who know my name is Lai (癞) are all my disciples ». The man left after saying this and disappeared without a trace. Two years after, another person came to meet Wu Zhong and presented himself as a student of Lai. The man kept his name secret and only said “my name is Pi (癖). 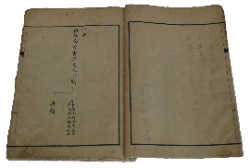 The man gave Wu Zhong a manual about the secrets mastery of Baji Quan and taught him the deep secrets of big spear..."
In the 13th year of YongZheng (雍正) Emperor (i.e. 1735), WuZhong was 23 years old and travelled alone to the south. In the JinJiang (晋江) Shaolin temple of Fujian province (incorrectly reported as ZheJiang temple in the records), he defeated many monks. He managed to enter and exit the Shaolin temple three times using a big spear, without being wounded by the hidden weapons and traps that where used at that time to protect such temples. He impressed the elder monks, and astonished the whole temple. As a sign of respect, the elder monks offered him a bag of flying daggers. The guardians of the temple were so impressed that they called him “god of spear”. From then on, “WuZhong the god of spear” was famous all over the country. Along with the famous Qin-na master Kang DaLi (康大力) of that time, and the famous master of TiLiuDao (提柳刀 - raise the willow sabre) called LiZhang (李章), they were called the “three heroes” in the martial community. The news that WuZhong had defeated three times the people of Shaolin temple spread very rapidly to the capital city. When the great general FuYuan (抚远, officially called AiXinJueLuo YinTi 爱新觉罗胤禔, bearing the official position of Prince Xun (恂), and 14th son of the KangXi emperor) who considered himself unrivalled in martial art heard about the news, he immediately ordered WuZhong to come to the capital for a contest. For the fight, both of them used the “Shu” (殳) as the weapon (an old weapon made of a bamboo stick used for the practice of martial arts) with white powder being coated on the extremity of the Shu, and the person who got the biggest amount of white powder marks on his clothes was considered as the loser. After several exchanges, YinTi had not even realize that his eyebrows were already covered with white powder, and considered this as a magical trick. White powder was spread again on the shu extremities, and they fought again, and the white powder covered again the eyebrows of YinTi before he could realize it. This made YinTi recognise the superiority of WuZhong and beg him to be his disciple. From this time on, Wu Zhong staid at YinTi’s official residence to teach his style. At that time, Wu Zhong’s reputation spread in the whole country under the form of this saying “南京到燕京，大枪数吴钟 : from Nanjing to Yanjing (i.e. old name for Beijing) WuZhong is the king of big spear”, but BajiQuan at that time had still no official name. The martial community of this time agreed that it was a new unseen and unheard style, and they were unable to find a name for it. Therefore, in historical data the style was referred as “Yi Shu” (异术 : unusual style) or “Wu Jia Quan” (吴家拳 : Wu family style). In the 40th year of the QianLong (乾隆) Emperor (1775) Wu Zhong, who was more than 60 years old, returned to MengCun and stood by his mother to do his filial duty. In the same time, he transmitted his martial skills inside the Wu Family clan. At that time, the members of the clan who were practicing were numerous, and there were three persons who were famous successors : his daughter and only child WuRong (吴荣), WuZhongYu (吴钟毓) a descendent of Wu SanShan (吴三善) and WuYing (吴溁) the grandson of Wu YunMing. Wu Zhong’s daughter (Wu Rong) got married at the age of 30 and left her father to leave with her husband. As a consequence, in order to avoid staying without an inheritor, Wu Zhong followed a chinese tradition of adoption called GuoJi (过继). When an important member of a family had no natural inheritor, this tradition allowed him to adopt a son or a grandson of one member of his own family, and to aknowledge him as his legit descendant and heir. This tradition was mostly used in ancient China in order to avoid that an inheritance would get lost or leave a family. Since WuZhong during his childhood was protected by his older nephew Wu YunMing, Wu Zhong felt grateful to him and thus adopted WuYing who became his favourite disciple. During the 7th year of JiaQing (嘉庆) Emperor (i.e. 1802), during the afternoon of the 15th of October, WuZhong died at the age of 90, after a painless life. Because there was no other relatives around WuZhong’s father’s (the venerable Wu TianShun) tomb, and according to WuZhong’s will, WuYing carried the body of WuZhong back to HouZhuangKe and buried it around Wu TianShun’s tomb. Ed. : There is nowadays a tomb assigned to Wu Zhong in HouZhuanKe village, but according to the Wu family research, the tombs in HouZHuangKe have been levelled off during the cultural revolution, and thus the exact location of Wu Zhong’s tomb has been lost.